02:07 | The Thailand military is training volunteers to assist with public safety during the funeral of the late king Bhumibol Adulyadej between October 25-29th. More than 1,000 people attended a training session over the weekend. 03:37 | The Constitutional Drafting Commission (CDC) will deliver two additional organic laws to the National Legislative Assembly (NLA) this week. One draft law relates to the Office of the Ombudsman, while the second relates to criminal offences by political office holders. NLA First Vice President, Surachai Liengbunlerdchai, said that he expected the draft budget for 2017 to be submitted on June 1. 04:52 | The political reform committee of the National Reform Steering Assembly (NRSA) is to propose that the National Legislative Assembly (NLA) discuss amending the Thailand Constitution every ten years. 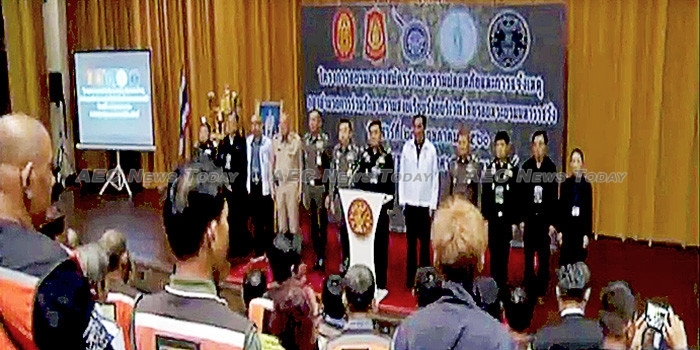 06:05 | A seminar in Bangkok has heard of results being achieved in a HIV vaccine trial being conducted by the Faculty of Tropical Medicine, at Mahidol University. 09:25 | Chiang Rai Vocational College has held an open day in an attempt to encourage more Thai youth to undertake vocational education training under the governments new dual education programme. Thailand corporate giants Central Group and the Minor International Public Company Ltd., have both pledged support for students taking management, retail business management and hotel and hospitality management training. 12:49 | Thailand’s Ministry of Commerce (MoC) is developing marketing plans to increase the sale of Thai organic products on the international and domestic market. 14:02 | Thailand’s Government Saving Bank (GSB) is set to develop new banking products targeting Thailand’s ageing population that will see no interest collected on the loans prior to the borrower’s death. Thailand’s elderly will be able to borrow up to 70 per cent of the value of their property, with the bank recovering its interest from the estate of the deceased. GSB President and CEO, Chatchai Payuhanaveechai, also revealed that more than 140,000 people with informal loans totalling Bt6.6 billion (about US$ 193.776 mil) – an average of Bt47,139 ($1,384) each – have applied for debt relief loans from the bank, which are capped at Bt200,000 ($5,872) per household. 15:32 | KTB Securities Thailand have advised investors to closely monitor the US Federal Reserve, which next meets in June, following indications of a US interest rate hike. 17:21 | The Eastern Economic Corridor (EEC) policy committee has signed an MOU with the Industrial and Commercial Bank of China (ICBC), the largest bank in the world by total assets and the third largest bank in the world by market capitalisation, to provide financial assistance to Thai and Chinese investors doing business within the EEC. 19:23 | The APAC 2017 Coaching Conference held between May 25-27 saw participants from 18 countries come together to share their coaching experiences. Thailand was complimented for its success in integrating religious teachings and business principles into its peace-promoting activities and community development.